Within your current website, you have some basic statistics showing in the 'thewebconsole.com' (the back end to your website). To really test and measure to get the best results from your online presence you need to go the next step. And that is with Google Analytics - a FREE traffic monitoring and analysis service, this is an awesome tool that enables you to track visitors, page views, referral sources and conversions all in one single interface. The data from Google Analytics is useful to develop and implement fresh website marketing strategies and understanding the behavior of your website visitors. 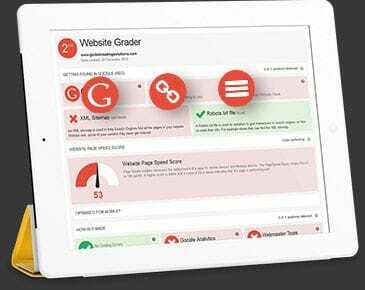 Google Webmaster Tools is an incredibly powerful instrument for analysing traffic data for your website. Knowing where your traffic is coming from and how they are finding you can help you make important decisions about content and ad campaigns. The best part is, Google Webmaster Tools is easy to sign up for and it's FREE! To learn more about signing up for Webmaster Tools go here. To set it up on your website, simply log into the 'thewebconsole.com', click on 'Settings' then click 'Marketing'. To get started simply create a Google Webmaster Tool account and verify your site by adding the meta tag they gave you (when you signed up for Webmaster Tools) to the second field under SEO Options so we can provide you with detailed reports about your pages' visibility on Google. Twitter is mainly used by businesses as a way to actively push out messages to your customer base, prospects that are following you and/or to assist you in search engine rankings in google. In its most obvious form, Twitter can be seen as a traffic generation tool, by placing your web address in your profile and in links within your messages. To help you take advantage of Twitter, we've built a great new feature into 'thewebconsole.com'. Now every time you write an article or blog entry, you can quickly and easily add it to your Twitter account from within the 'thewebconsole.com'. When you have completed an article or blog entry, it will ask you if you want to send a tweet to your Twitter account and automatically create a link back to your article / blog entry. To add your Twitter account details, log into the Webconsole, click on 'Settings' then click on 'Marketing' and fill in your details. If you are looking at generating results from your website, it is of paramount importance that you update or change your web content regularly. Changing or adding content on a website regularly not only shows that the business is alive and kicking but registers with search engines, such as Google (more so now with the Google Caffeine), keeping the site high in the rankings and more visible to Internet users. Making website content interesting, relevant and helpful also ensures revisits. To change your content, log into the 'thewebconsole.com', click 'Manage Pages' then click 'Current Pages'. Once there click the edit button on the page you want to edit. To really get results, look at utilising articles and blogs on your website for ever changing content, include links in your content to other parts of your website with keywords within, and even if not utilising set up a Twitter account and feed it - to improve your search engine results. 5. What are your objectives on your website and are they being achieved? What do you want your website to achieve for your business? What strategies do you have in place to achieve this? Are you measuring this? Whether it to be to attract new leads; increase your conversion rate; sell more products online; book more events; encourage your existing clients to stay longer, buy more; streamline your business etc etc? These are the questions you must know the answers to, and will make the difference between an online presence that does OK to one that generates great results for a business. It is important that once you set these goals/ objectives that you clearly measure these results so you can regularly review and improve. Utilise the features of your Google Analytics account, setting the goals so you can measure these specifics. These online workshops are designed to help educate you, giving you ideas and strategies to increase the results you are achieving online. The Webinars will commence in July, with the first one being on Social Media and then regularly after that we will have more covering all aspects of the Internet. The objective of these workshops is to enable you to expand your knowledge and get you to take action on different areas of your businesses online presence. Once you register for these events, we will send you the login details to view the screen and hear the presenter at the nominated date and time. If you have not done one of these before, it is a good idea to login earlier so you can ensure you can view the screen and your audio is working for you. If you can't make the event on the day, still sign up you as you can access our webinars at a later date, as they are recorded. By attending our webinars you are keeping your knowledge up to date and with knowledge comes wisdom, action and better results. Webinars are becoming more and more popular in business settings because they save time and cut travel costs. This assists in bringing people back to your website, as well as adds content automatically to your Facebook page as you add new content. Log into your Facebook profile, click on options then click on settings. Then enter the URL for the RSS feed in the displayed box. Check the box next to the statement that you actually own the content. You'll be shown a preview of the RSS import, you then need to confirm that you want to continue this import. By adding a RSS feed to your Facebook it feeds instant content from your blogs and articles to your Facebook profile. If 86% of all people when looking for a business service or product is researching online, then it is essential that you work on getting your business to appear high in the search results. One of the quickest ways of doing this is to register in Google for your business to appear in their maps. Why, because 70% of the searches for businesses, services or products put a location in that search. And when they do a Google map appears with businesses for that key word, in that location appearing at the top of the listing. Each business address is allowed one listing, so identify what keywords that you want your business to appear for and register it. Do you research first, as sometimes it is better to appear within a less searched keyword so you appear more frequently than a more popular one. To assist your business appearing more, also get customers to review your business as this helps increase your ranking in this list. To create raving fans you should be using your Database Marketing System to its full extent. Send personalised email marketing to your database to help build your relationship with your clients and turn them into raving fans. Show your customers that you care about them by sending a personalised messages eg. Birthday, Anniversary, Messages, Asking them to attend events, fill out surveys, sending them tips and guides etc etc (If you haven't read, I recommend you read 'Goldmine Strategies' ebook to give you some ideas to determine which strategies would work best for your business). You will boost your sales and strengthen your relationships by sending simple messages, and many of these can be automated so they are a simple and inexpensive way to show your customers that you value and appreciate them. You can also use the Survey tool to help gain insight into the thoughts and opinions of your customers so you can better meet their needs. This will give you an opportunity to show them that you want to listen to their thoughts, feelings which in turn create raving fans. If you have a shopping cart on your website, or are happy to pay someone to send you leads - using an affiliate management tool is a great way to get more customers and make more money for your business. Once a purchase is made on your website from a referrers lead, the referrer can be paid when the sale is made. The referrer can then log in and view what their balance is up to and when payment was made to them. Affiliates can be from two sources, 1) from people who make it their business to sign up to be websites affiliates to make money by promoting others products to their database, or on their websites; 2) from a business / organisation / website that is popular with your Niche Market - you can contact them direct and get them excited about making money by just simply promoting your products within their emails or website. By using Affiliate Marketing you can spend more time making sales and building your business. You should regularly have a discussion with your Internet Consultant about your online presence, they have you on a call cycle already - but don't feel shy about booking a time to go and meet them or have a discussion over the phone. They can review your website for you and make suggestion for improvements, but also you should come armed with questions about strategies you want to try. Our goal with our newsletters, ebooks, articles, support material, the home page of your Webconsole, Webinars and other resources is to give you the guidance so you are more informed than your competitors and achieve results online. Make sure you use our resources to get you the results you deserve online.